The FTC has issued the final rule for updating some aspects of their labeling regulations, including the requirements for the business name and address. Note that these revised regulations will apply to non-cosmetic items, including to soap that is exempt from the definition of a cosmetic (see Soap, the Chameleon). (c) The statement of the place of business shall include the street address, city, state, and zip code; however, the street address may be omitted if it is listed in a readily accessible, widely published, and publicly available resource, including but not limited to a printed directory, electronic database, or Web site. The OLD regulation said that the street address could be omitted if it was listed in a phone or city directory. 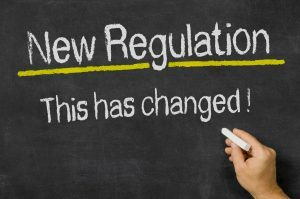 The NEW regulation says the street address may be omitted if it is listed in a readily accessible, widely published, and publicly available resource. While “readily accessible” and “widely published” are not defined, I would expect that any site that could be accessed by the public and found in a Google search would be acceptable. Since it also mentions and “electronic database,” it’s likely that an online state business listing would also suffice. Keep in mind, though, that the street address must be included in the website or listing. (Again, not a PO Box, not a mailbox service.) The point being that a customer COULD find your street address if they looked – but it doesn’t have to be directly on the label. This is good news since it makes it much easier to qualify to omit your street address from the label if you want to. Hi Maria Gale . First i want to say thank you for your work helping our industry. I am making a room spray for a kids room. Do I need put all ingredients on room spray? I have seen a lot of room spray on stores and they do not have a list of ingredients. Thanks. A room spray isn’t “applied to the body” so it’s not a cosmetic — no ingredients needed. One thing to just keep in mind – if you use a high percentage of alcohol in the room spray, check for the flammability. If it is flammable, it may need shazardous warning. Info on that is at the Consumer Product Safety Commission. Hello Maria Gale . Quick question to really understand the matter. IF I sell handmade bath & beauty products, I can not list my P.O. Box (which looks like a street address via UPS Store) on my labels? And, I rent so, the property managers disallow using their address for ANY business-what happens now? Very disappointed. You are in an interesting postion between a rock and a hard place. The law (Fair Packaging and Labeling Act) requires that the business name and address be listed on the product label. It is supposed to be the physical location – the primary location of the business or the place where the product is manufactured – is required on the label. A PO box or a mail box service (such as UPS or Mailboxes, etc. doesn’t qualify). Since your property manager disallows using your physical address for any business, and the laws require the physical address …. if you remain where you are, no matter what you do you’ll be in violation of an agreement or law. The best I can suggest is that you figure out which is the “least wrong” of the possible solutions and go with that, knowing that there still could be some repercussions down the road. There are many cities that have small business offices, store fronts for $150-$350 depending on your city. Invest in your business and step out split your manufacturing process… for example we did this for a while before getting our store fully operational. Mix the soap and cut at home, set up your shelves for curing , wrapping, packaging, and shipping (maybe selling locally ) , in the small space you rent. Then you can use that address on your labels and not violate any policy! What a great idea! There are also shared business offices in some cities – if you use that for your “business headquarters” that would suffice as the physical location. Keep a computer (or bring a laptop), do your accounting, planning, website updating there and manufacture elsewhere. Growing up from there, I’ve seen “storage” type facilities that have a small office space attached to the storage unit. They probably aren’t very expensive, and could be used for storage, manufacturing (maybe — if you can get water), and office space. Having your address listed on your Etsy sales site should meet the requirements for the street address to be omitted —FROM THE FTC. So that means it applies to products regulated by the FTC. That would be soap – not cosmetics or soap that makes cosmetic claims. For cosmetics (including soap that is a cosmetic) the FDA hasn’t changed their interpretation of the law or regulation – the last thing we have from them is “a listing in a print or online directory”. Thank you so much for your reply! I just want to make sure I understand correctly, if the item is a soap and just plain soap with no cosmetic claims, it’s under the FTC. According to the FTC regulations, if my address is found under a google search or is listed on a website or Etsy shop, I don’t need to list the address on the soap label, is that right? I have seen some homemade lip balms that don’t have their address on their labels. For instance, I have seen a business in another state who does not have her address on her lip balm labels. Her website doesn’t have her address, either. However, if you do a google search, her address comes up that way. After seeing this, I was hopeful I could label my lip balms in the same way. Thank you again for your time and wealth of knowledge interpreting these confusing regulations! Yikes. So if I’m understanding this correctly, any buyer would have access to my personal home address if I am making soaps at home and don’t have a business? Creepy. If you are selling a commercial product, then yse, part of the packaging includes the requirement of a name and address of the person/business “responsible” for the product. If you are making and selling out of your house, then yes, it would be your home street address. Those laws have been in place for 50 years. I know this is old, but, since my address is listed on Etsy, do I still need to list it on the lip balm label? Yes – your full address, including the street address, city state and zip code are required on the product label. The only exception is if your address is listed in a print or online directory. Being that my address can be omitted. Do I still need to put city and state on the label? Or is a link to my website just fine with the address on there? You need the city, state and zip code. Does my full name, city, and state need to be on my product although my address can be omitted? Or can I just have my website listed on the label? To be concise, since my address can be omitted from the label.. What should be listed on my label as far as WHO makes it? Thank you very much btw. I’ve learned so much from you already. The business name must be listed. If it’s not the business that makes and sells, it can be modified by “Distributed by ….” or “Manufactured for …” It should be the name of the “responsible party” … that is, who the FDA or FTC or a customer should contact in the event of a problem. I must be the legal name — if it’s just you, then your personal name; if you have a DBA, then it can be the “ficticious name” or “doing business as” name. If you are incorporated or have an LLC, then its the name of the business entity. If it’s NOT your personal name, it would be the name registered with your state. The city, state and zip code must be listed, regardless of whether the street address is included.